First Selectman Jayme Stevenson attended the Pear Tree Beach Building Committee meeting to listen to neighbors' concerns. Taken Nov. 28. DARIEN — Pear Tree Point neighbors will no longer have to worry about a restaurant on the beach in the near future. The Parks and Recreation Commission unanimously decided at its Nov. 28 meeting to remove a year-round restaurant from the list of potential changes to the beach. Commission Chairman Mary Flynn said after discussion with Planning and Zoning Director Jeremy Ginsberg, it was determined the idea was not feasible. “We’ve heard loud and clear that it’s something that may not even be approved,” she said. Commission member Susan Daly said the idea of the restaurant was never concrete and was on the list of objectives to give the committee flexibility. The decision was met with a round of applause from the packed room of Pear Tree neighbors. The commission also unanimously voted to remove two multipurpose rooms that were originally planned for any new structure on the beach. The commission then voted to add a flexible space for community use to the list of potential upgrades. “This will scale it back and help the committee,” Flynn said. The request for proposal (RFP) for professional design services for the Pear Tree Beach Park improvement project was also approved Nov. 28. 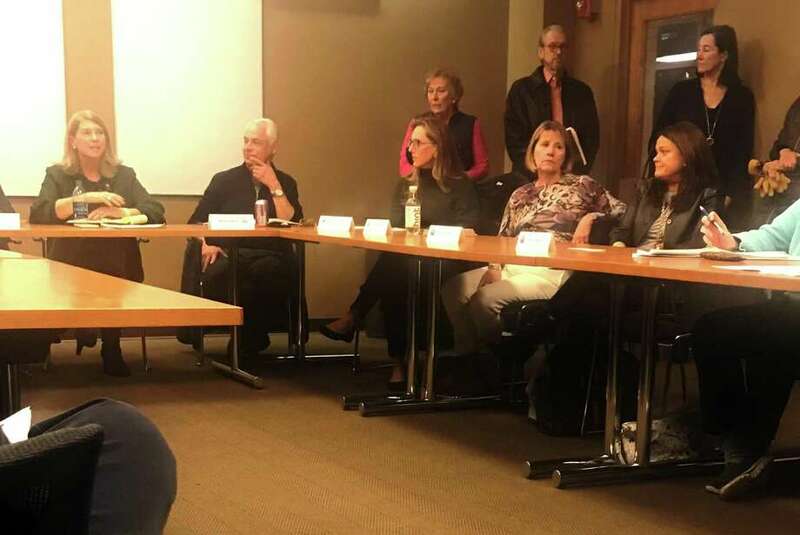 Residents voiced their concerns about the upgrades during a special Parks and Recreation meeting held prior to the regular meeting that night, conducted by First Selectman Jayme Stevenson. Resident Jim Arrington said his biggest problem was with the request for proposal stating it would fix the drainage issue. He said the RFP was a waste of the town’s money and does nothing to mitigate the biggest risk faced: flooding. Over the years the flooding has gotten worse, he said. Tom Igoe, a 40-year Darien resident, said it is mportant that people are able to enjoy the space throughout the year, adding the structure changes could greatly impair the natural characteristics of the beach. “I believe that any steps taken to rehabilitate and upgrade the facilities in the park should be fashioned as such so they don’t destroy or mar the unique characteristics of this beautiful place,” Igoe said. Neighbors to the beach also asked that they were represented on the committee. However, Stevenson said the Board of Selectmen said they already solicited for volunteers on the Pear Tree Building Committee.